Biofouling growth may be partly prevented during the design phase, by using suitable materials (i.e. copper, AISI 316 stainless steel or treatment of the surfaces with special polymers) and by dimensioning the pipes in such a way as to obtain a flow rate (> 1 m/s) which will hinder adhesion of the organisms and to avoid stagnant points as much as possible. There are physical and chemical preventive methods for controlling fouling in cooling water systems. Physical treatments are mainly used during shutdowns. Chemical treatments are based on non-oxidizing biocides or, more commonly, on oxidizing biocides, like chlorine gas. Compliance with regulations on water discharges and the necessity of safe biocides to handle often leads to the choice of chlorine dioxide as biocide for cooling systems of large plants. In this kind of plants, experiences have proved that Chlorine Dioxide is much more effective than Hypochlorite. The reason for that better effectiveness of Chlorine Dioxide is briefly here explained. If we think at the cell walls (of bacteria or marine organisms), they can be imagined as a long chain of phospholipids. Each phospholipid has in its head a phosphate group which has a negative charge. 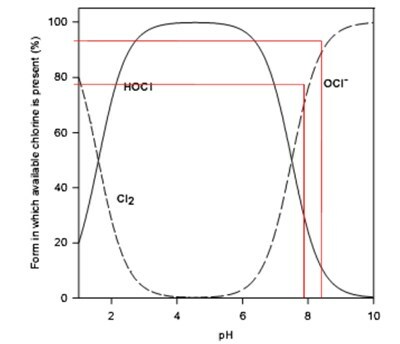 When Hypochlorite is injected, it rapidly dissociates in Hypochlorose Acid (HOCl) and Hypochlorite Ion (ClO-) and, at the PH of the seawater (7.5 – 8.5), the dissociation is around 20% of acid and 80% of ion. Since the Hypochlorite Ion has the same negative charge as the phospholipids of the cell wall, there is an electro-magnetic repulsion between the two molecules. This means that if 1 PPM of Hypochlorite is injected, only 0.2 PPM is actually effective against the fouling, the remaining 80% is simply wasted in the water. Chlorine Dioxide is a gas diluted in the water and it follows the same pattern of Oxygen. 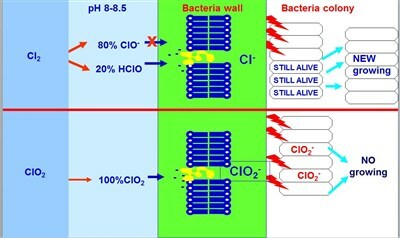 Bacteria and marine organisms breathe ClO2 along with Oxygen, therefore it is very easy for it to enter the cell wall and start its oxidation action. Besides, when Chlorine Dioxide oxidises the organic material inside the cells it is reduced to Chlorite (ClO-2), which is not a biocide, but has the very interesting feature of being a biostatic agent, it stops the organisms’ reproduction cycle. Organisms recover their reproduction capability in 6-12 hours (depending on some environmental parameters). This behaviour allows shot treatment instead of the continuous one. As soon as they recover the reproduction capability in the interval between two shots, another one is performed and the bacteria colony has no chance to grow. So it is normally suggested a shot strategy for dosage (instead of continuous one): since the goal to be achieved is to limit the bio-fouling growth on the surfaces (pipes etc…), treating the intake basins the bio-fouling has no sufficient time to grow in the hours between two shots. By the way, it is important to know that a stronger strategy can be managed by the chlorine dioxide treatment, when needed, thanks to the better tolerability shown (for instance) by RO plants and distillers. Moreover, it’s well known that Chlorine Dioxide is a bromate-free water treatment. Bromate is one of the greatest concerns for potable water and/or for the outfall of cooling circuits, when seawater is used (bromate can be formed also in the intake treatment and, therefore, its releases in the environment can create a toxic issue in the outfall of the plant or can cause cross contamination of bromate-free waters). That is the reason why Dubai first and Qatar later have switched all their potable water treatment from hypochlorite/chlorine to chlorine dioxide.